Necktie Size: 139cm/54.72 inches in length, 8.5cm/3.35 inches in width(the widest point). 100% Polyester for both fabric and interlining, soft to make a tie knot and solid to provide a tidy droop. Smooth feel, hard to twist or turns, never fade or stain. The must have accessory for men, suitable for any occasion when you need a formal suit and want a chance to personalize yourself. It's recommended to be rolled for storage rather than being hung on a tie rack. Package including: 1 × gray striped necktie, 1 × gift box. 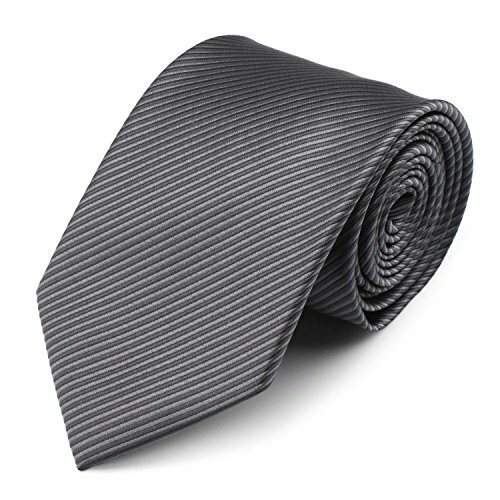 Classic striped necktie in gray, highlight your mature and steady, easy to match most formal wear. Soft and smooth as silk, but strong enough to hang straight down from your neck. 100% Polyester Material - Professional 45 degree cutting, solid and wearable, easy to prevent wrinkle or folds, without color fading. Professional Necktie - suitable for most formal or casual occasions, such as wedding, party, appointment, job interview, meeting, negotiation and business events. A wonderful business suit accessory for men. Come with a nice gift box, which make it the most practical gift for your Dad and husband on any special day! Length: 139cm/54.72 inches; Maximum Width: 8.5cm/3.35 inches; Gift Box: 10.5×10.5×7.5cm/4.13×4.13×2.95 inches.